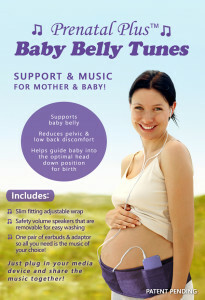 Baby Belly Tunes was designed to help support mamas growing belly and relieve common low back strain during pregnancy. It has been proven to help guide baby to the “optimal head down” position for birth. Safety volume speakers to calm and relax both mother & baby throughout pregnancy. The Best part of Baby Belly Tunes is the ability to listen to music with baby and have the safety decibel speakers to protect baby’s ears. Such a great benefit in calming babies and helping to guide them “head down” for labor & birth. This will help prevent back labor and make birthing time shorter and easier! The wrap comes with everything you need, earbuds, adaptor & safety decibel speakers. Just plug in your “music device” and enjoy together or keep baby calm while working, etc. Pieces are removable for easy washing. Two sizes S-M for the petite to L-XL for the larger bellies with expanding velcro closure for growth during your nine months. 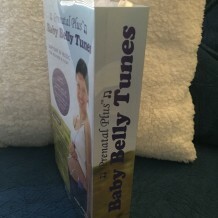 Once baby is born, simply use the wrap to support your hips and abdominal muscles, while the peel & stick speakers can be used on baby’s stroller or crib to hook up the “same” music played in utero which will again calm them as they will remember !